I go for a walk most lunchtimes between home and Sainsbury’s to keep up some semblance of a fitness regime. Just before a 't' junction on route, this disintegrating road surface could be seen for a period of time. To me it is a beautiful pattern and shapes with yellow powdery material exploding downwards. The piece fits with the strata like rural images described elsewhere. 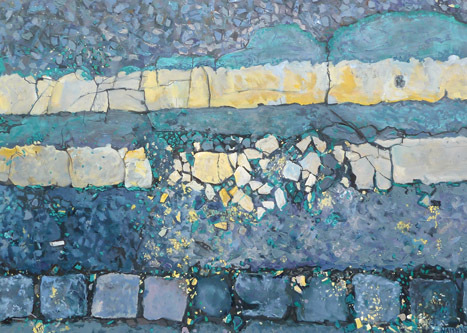 Although a figurative representation looking down onto the road surface, the choice of view suggests abstraction. Although I love this piece for aesthetic reasons, I also like the story it tells. Here we have some old elements showing through the decaying new elements. The square stones denotes the lowered curb for people's driveways. This format is I think fairly uncommon in Luton as most roads seem to use larger curb stones similar to the higher curb. The more recent green delineation of a cycle lane is almost completely destroyed. The double yellow line also has issues though still visible. So this piece has political overtones too, showing how creating cycle lanes may tick a box with politicians and yet done on the cheap it neither solves the problem nor lasts particularly long.